Bottle painting is a way of upcycling a bottle with hand painted designs like geometric, tribal, henna, floral, hombre, etc and many more. These hand-painted bottles adorn the corners of rooms as vases or can be used as a centrepiece for tables! 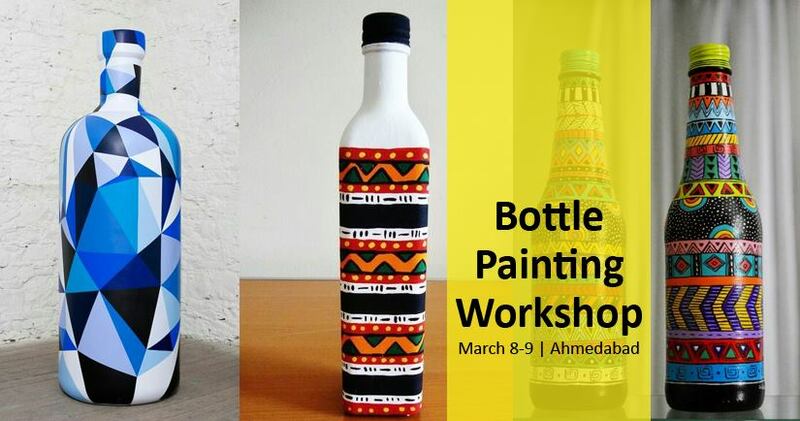 Come and learn the techniques involved in painting a cylindrical surface in this two days workshop and take two hand-painted bottles with you. – Learning different painting techniques. – Using paper cutouts on bottle for creating designs. – Using color cones for 3d designs. – Sealing the bottle artwork. – Students need to bring their own set of two bottles that are cleaned and without any paper labels, Basic stationery, apron and paint brushes. – No prior painting experience or skills required.